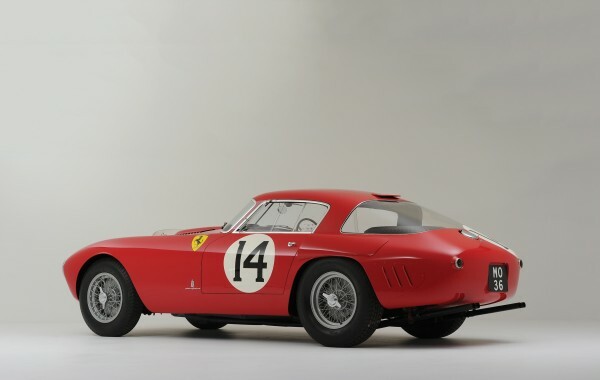 Combining rarity, powerful mechanical specifications, important racing history, and ravishing coachwork, 0320AM is one of three 340/375 MM works race cars that Ferrari entered at the 1953 24 Hours of Le Mans in its efforts to counter mount competition from Jaguar, Maserati, and Lancia. All three cars featured a brand new Pinin Farina body derived from the 250 MM design. Both 0320AM and 0322AM were built on a late 340 MM chassis with a 2,500-millimetre wheelbase Tipo 340/MM/53, each carrying a 4.1-liter V-12 engine, whilst 0318AM rode on the same chassis type, but it was powered by a 4,494-cubic centimetre long-block Lampredi V-12 derived from the 375 Formula One cars. Wearing number 14 at the 13th June Sarthe race, and piloted by Mike Hawthorn and Nino Farina, 0320AM advanced to 2nd place after 12 laps, before being disqualified for adding brake fluid during a pit stop, violating an obscure and old rule that prohibited the addition of any fluids before the 28th lap. The following month, 0320AM underwent a number of factory upgrades. The original engine, internal number 70M, was disassembled, and the capacity was increased to 4.5 litres. The car also received body modifications during this time. 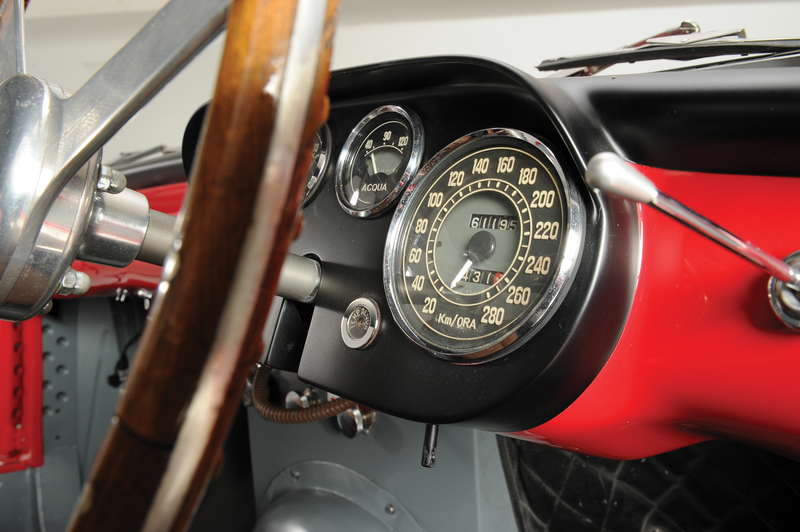 A more-streamlined nose with recessed covered headlamps was added at the request of the drivers to improve the down-force at high speeds, and the wraparound rear glass was also replaced with a smaller glass pane abutted by larger sheet metal sections to reduce headlight glare during night-time racing. Following a DNF, due to rear-axle issues, at the 24 Hours of Spa on 25th July, 0320AM contributed to the 375 MM’s competitive distinction on 15th August with a 1st overall finish at the 12 Hours of Pescara, with Mike Hawthorn and Umberto Maglioli behind the wheel. Chassis 0320AM was then delivered by the factory to its first private owner, Tullio Pacini, of Rome, Italy, on 9th October. 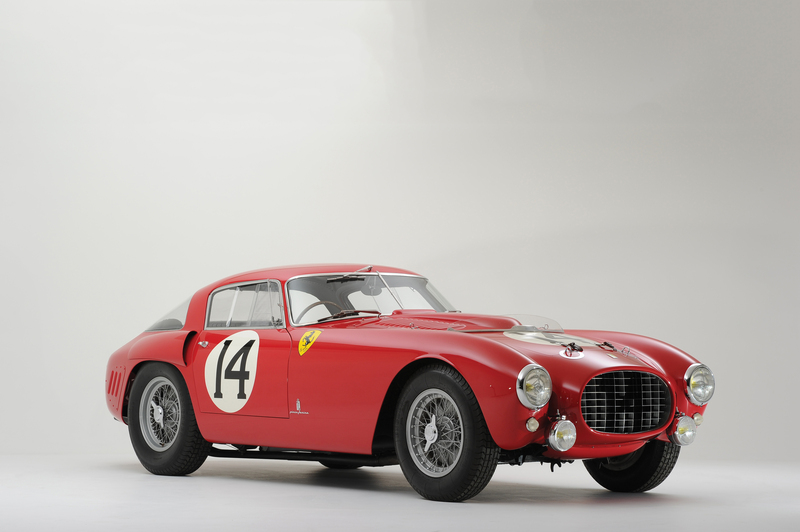 In late November of 1953, this 375 was one of five Ferraris entered in the legendary Carrera Panamericana, where Enzo Ferrari showcased his cars to the North American market. With all five 375 MMs competing under the private banner of Franco Cornacchia’s Scuderia della Guastalla, 0320AM began the race driven by Mario Ricci. During the fifth stage of the Carrera, Umberto Maglioli’s 375 MM, chassis number 0358AM, lost a rear wheel, and he then got behind the wheel of Ricci’s 0320AM. He advanced the car from 8th place to a respectable 6th-place finish. Averaging an unbelievable 138 mph for 223 miles, Maglioli and 0320AM set a public road stage record that has yet to be broken. In combination with Guido Mancini’s 4th-place effort in 0322AM, Maglioli’s finish garnered enough points to propel Ferrari to the 1953 Manufacturer’s Championship. Chassis 0320AM appropriately finished the 1953 campaign with a 1st-place finish at the Circuit of Guadeloupe in December, once again driven by Maglioli. 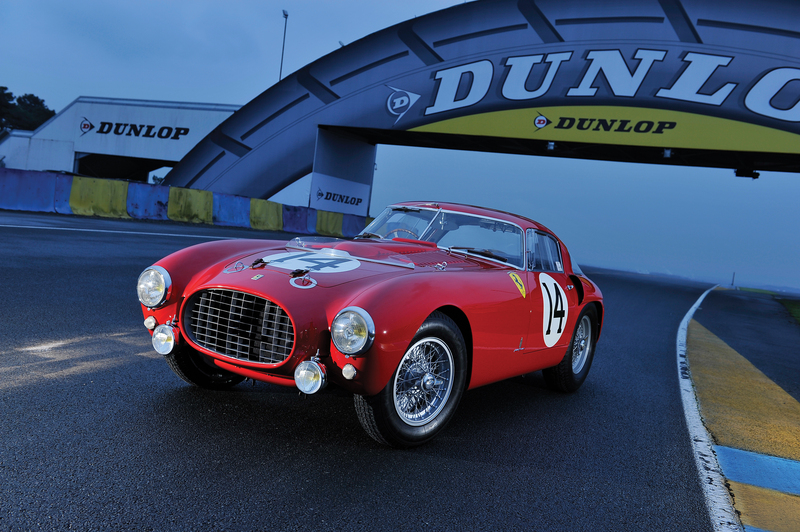 In 1954, 0320AM was purchased by Luigi Chinetti Motors and was imported to the United States. Initially purchased by Walter Luftman, of Rye, New York, this important Ferrari was sold in late 1955 to Mark and Louise Schellenberg, of Denver, Colorado. Following a minor collision to the front-end, the nose was modified by Charlie Lyon, of Denver. 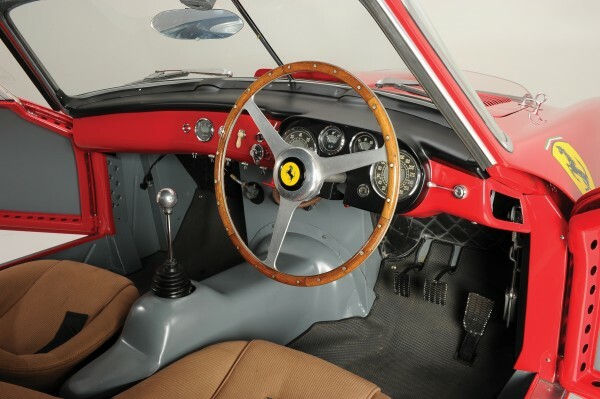 At this time, the opportunity was also taken to return the rear glass to the large wraparound style originally designed by Pinin Farina. Soon thereafter, 0320AM was acquired by Richard F. Merritt and William Rhodes in 1958. They in turn sold the Ferrari to William de Creeft, of Santa Barbara, California. He enjoyed the car for 12 years, until it was purchased by Gene Curtis, of Manhattan Beach (notable as Ernie McAfee Engineering’s head mechanic during the Southern California Scuderia’s mid-1950s heyday). Chassis 0320AM was restored in 1974 by Steve Griswold, of Berkeley, California, and two years later, it was purchased by Robert Sutherland, of Denver. Campaigned in August 1976 at the 3rd annual Monterey Historic Races, 0320AM was concurrently presented at the Pebble Beach Concours d’Elegance, winning Best in Class. The car was exhibited and shown by Mr Sutherland several times over the next 17 years, also running at Watkins Glen, Elkhart Lake, and the 1989 Mille Miglia. In March 1993, 0320AM was sold to Jerome Sullivan, of Hartland, Wisconsin, and it was soon refurbished by the region’s premier Ferrari restorer, the renowned Wayne Obry. The 375 MM was displayed at several Cavallino Classic meets over the next few years, before being acquired in 1999, by Sir Anthony Bamford, of Stoke-on-Trent, England, who presented it on 4 June 2000, at the Louis Vuitton Concours d’Elegance, winning the Best of Show and the TAG Heuer “Cheating the Wind” trophy. Exhibited at several discerning European events during this period, 0320AM was also featured in the December 2000 issue of Classic & Sports Car magazine. 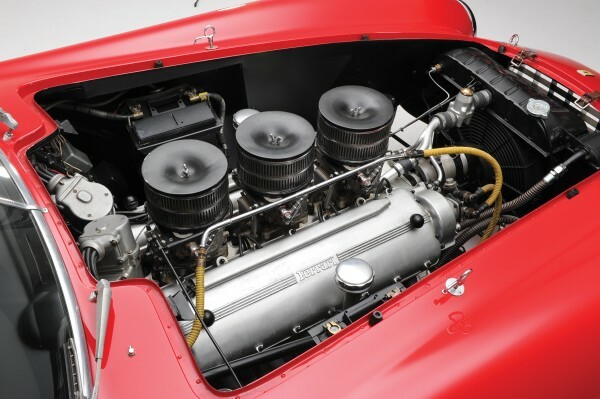 Acquired by the consignor in July 2006, this breath-taking example of the legendary 375 MM was treated to exacting body restoration work in August 2006, care of Shapecraft Ltd. in England. This work entailed enlarging the rear-wheel arch intakes and reshaping the nose to its original style with non-recessed headlamps. 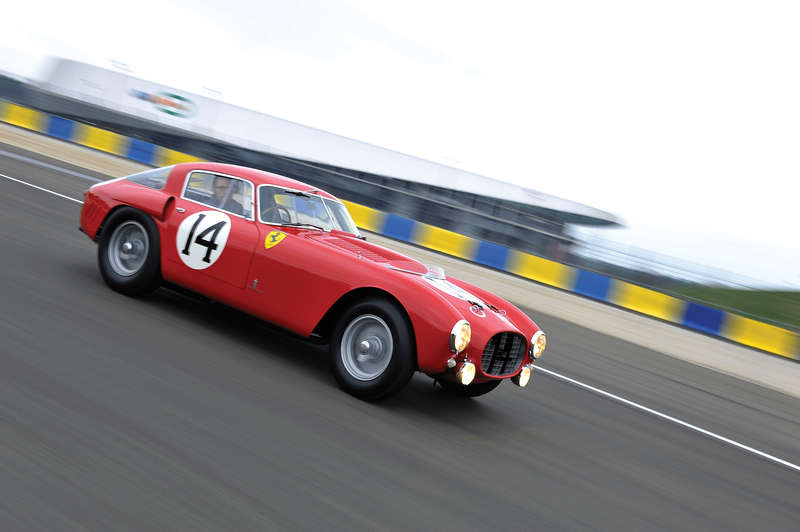 Currently, 0320AM is finished in its correct livery, as it appeared at the 1953 Le Mans.